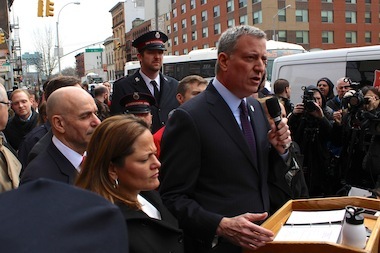 Mayor Bill de Blasio announcing housing options for vicitims of the East Harlem gas explosion on Mary 14, 2014. EAST HARLEM — Mayor Bill de Blasio promised Friday to soon find housing for all the people left homeless by the gas explosion in East Harlem earlier this week. Officials said 55 families have registered for help so far, and will begin moving out of temporary shelters and into housing to fit their needs within the next 24 hours. A total of 91 apartments were ordered vacated, according to officials. The first wave of families will begin moving into private apartments operated by the city’s Department of Homeless Services or, for individuals, apartments run by the YMCA, according to the Mayor said. Families could begin moving in as early as Friday, he said. Longer-term options were also being made available through Real Estate Board of New York. According to the Board’s president Steve Spinola, 34 apartments of different sizes have so far been identified by REBNY members and will be available for use for up to three months. The city will match units with displaced people based on need, according to Spinola. For those in need of permanent housing, the city will turn to the New York State of Affordable Housing to locate options for those affected by the blast. “We are committed to doing all we can to assist this community in this time of need,” he said in a statement. Luis Rivera, 52, who was blown off his feet in his 1652 Park Ave. apartment by the blast, has spent three days living in the Salvation Army shelter. "I just want my home back," he said outside the East 125th Street building on Friday. "I don't have no place to go now. My wife is okay, though, and that's the most valuable thing that I have." Regardless of which level of housing need, de Blasio said the city was working on ensure families would remain close to their original homes.